800 million users are actively on Instagram every month. So how do you make your posts stand out more than the other 799,999,999 users? Think of emojis as the bullet points of Instagram. 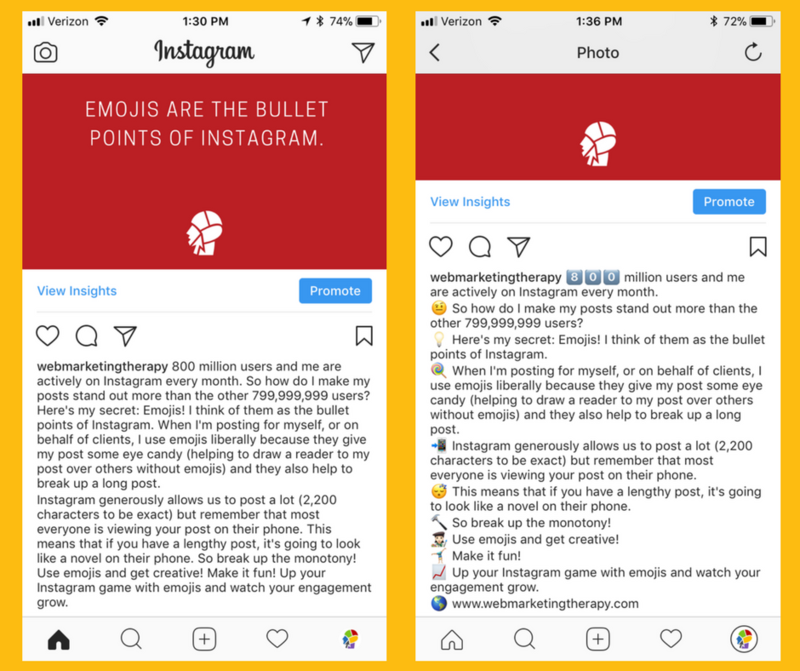 When I’m posting for myself, or on behalf of Web Marketing Therapy clients, I use emojis liberally because they give my post some eye candy (helping to draw a reader to my post over others without emojis) and they also help to break up a long post. Instagram generously allows us to post a lot (2,200 characters to be exact) but remember that most everyone is viewing your post on their phone. This means that if you have a lengthy post, it’s going to look like a novel on their phone. So break up the monotony! Use emojis and get creative! Make it fun! Up your Instagram game with emojis and watch your engagement grow.